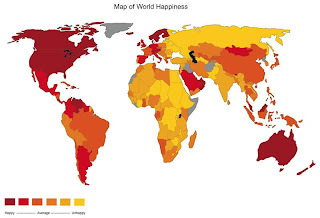 Can Gross National Happiness ever be an accepted substitute for GDP? The Kingdom of Bhutan, a predominantly Buddhist country of approximately 750,000 inhabitants in the Eastern Himalayas, has been measuring Gross National Happiness since the late ’80s. The King, Jigme Singye Wangchuk, was concerned about the sorts of issues affecting countries which focussed only on increasing economic prosperity, and as a result, he declared that GNH (Gross National Happiness) not GDP, was the priority for his people. “The ultimate purpose of government”, he said, “is to promote the happiness of its people”. This, of course, was more than a decade before Martin Seligman launched the Positive Psychology movement. Now, says writer, analyst and UN Editor Rasna Warah, GNH vs GDP has become an issue in the upcoming Kenyan elections (December 27th). In this article on the All Africa Global Media website, Warah explores the background to GNH, and why it matters. It’s the case that back in 2006 presidential candidate Dr Raila Odinga, cast doubt on the accuracy of Kenyan economic growth figures being quoted by other candidates, and proposed that a GNH survey be carried out instead. In an interview with Nation Magazine, Odinga is quoted as saying: â€œPeople are happy when they put food on the table, feed and educate their children.â€ However I haven’t been able to find any mention of Gross National Happiness on Odinga’s election website. Could it be the case that when the chips are down (and when votes are needed) what people really want to see is good old-fashioned economic growth?